The colocation data center market is very well insulated against the huge shift in enterprises pushing IT workloads to the cloud, according to Synergy Research Group. The colocation industry is in fact thriving, the analysts said. There have been quite a few reports suggesting that cloud is threatening or killing the data center. These articles might be guilty of taking a contrarian position to gain some attention, presenting near-dystopian images of massive Amazon Web Services and Google data centers containing all human data. These reports happen every year. Mad Money’s Jim Cramer famously advised getting out of data center stocks in 2009 and again in 2011 because a new technology (cloud) meant doom and gloom. To paraphrase Mark Twain, reports of the data center’s death have been greatly exaggerated. Quarterly earnings by data center providers suggest the wholesale move hasn't happened, but rather cloud is prompting a general move and comfort with multi-tenancy (from software to facility). Worldwide retail colocation revenues continue to grow at around 10 percent per year, with Netherlands, Germany, and the U.K. markets growing at above average rates. China’s growth rate is more than double the average, according to Synergy Research. 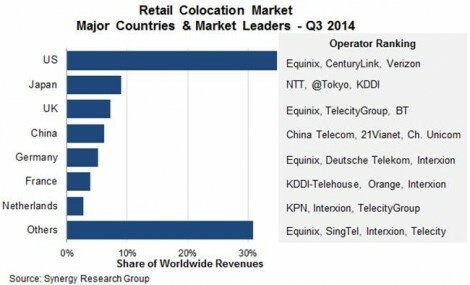 U.S., Japan, U.K., and China lead in retail colocation revenues, and the seven largest country markets account for close to 70 percent of worldwide retail colocation revenue. The U.S. alone accounts for over a third of the retail colocation market, about equal to the next six largest country markets. Equinix is the dominant player in three of those markets, and Interxion has a top-three ranking in three of the markets, notably in Europe, where it does well in several countries. Each market has its own unique mix of types of providers, said Synergy Group Chief Analyst John Dinsdale. However, Equinix has a sizable lead. Most of the spend on retail colocation doesn’t come directly from enterprises, but from various types of service providers such as cloud, IT, telcos, and content providers. In the U.S. the current split is just over 60 percent from service providers and just under 40 percent from enterprise, according to Dinsdale. There has been and continues to be a steady stream of blockbuster deals in the colocation data center market. The driving force behind acquisitions is to expand footprint and get into complementary cloud and service offerings. “There has been a little activity in the opposite direction (e.g. Equinix selling off a few non-strategic data centers to 365 Main, which has been renamed into 365 Data Centers), but the main traffic has undoubtedly been towards consolidation,” said Dinsdale. Worldwide retail colocation revenues continue to grow at around 10 percent per year, but China’s growth rate is more than double the worldwide average, according to Synergy. The Chinese market has garnered significant attention lately due to its potential. Dinsdale believes the market is dominated by Chinese telcos (China Telecom and China Unicom) and some large Chinese data center operators (21Vianet, GDS, Dr Peng Data). “[While] some global or regional players have established a presence (e.g. Equinix, PCCW, Telehouse, Pacnet), there is no doubt that the market will continue to be dominated by the big Chinese operators,” he said. Outsourcing in general has become a preferred model as cloud has made businesses comfortable because it takes out the Capex guessing game and lets them shed non-core operations. The outsourcing is occurring to both global cloud giants and local providers. Many businesses want to keep their data nearby, meaning growth is emanating out to secondary markets, not consolidating onto the Google, Microsoft and AWS clouds. The big clouds are growing, but not at the expense of private cloud and local cloud through systems integrators, VARs and service providers. Consider Cisco’s recent Global Cloud Index – not only is data center traffic expected to triple, but private cloud is projected to grow at a 21 percent CAGR, despite losing overall market share to public cloud (from 78 percent market share to 69 percent market share). A recent IDC report that predicts the number of the world’s data centers will decline in 2017, however this is due to moving workloads into mega data centers (be it cloud or multi-tenant data centers). Colocation industry trends suggest that, while many are moving workloads to cloud, colocation players are thriving as many of these clouds are housed within their walls. While Microsoft, Amazon and Google build their own mega data centers, not all workloads are moving wholesale into public clouds, and colocation is positioned nicely for those seeking hybrid infrastructure and multi-cloud usage.